I first met Pat Jones and Donna Eddins in 1990 at the Gulf Coast Women’s Music Festival in Mississippi. They were videotaping the event and would I give them permission to record my set? This was before everyone and their sister had phones with video or even home camcorders, so of course I said yes. Over that long weekend I got to know them better and when they offered me a place to stay my next time through their hometown of Memphis, I didn’t hesitate. I loved their warm and direct manner. Neither suffered fools gladly and they worked tirelessly as LGBT activists — my kind of people. They taped festivals and other events with professional grade equipment, produced concerts, and did an LGBT radio show, all in the deep south. Here’s Pat talking about bringing comic Robin Tyler to Memphis in 1980. She also mentions Meristem, the women’s bookstore that existed there in the nineties. Jo-Ed Video (a combination of the first two letters of their last names) created a legacy of 200 video tapes, from a 1980 performance of Meg Christian at a southern LGBT conference, to the National Women’s Music Festival (1982—1997). Well-known performers Holly Near, Kay Gardner and Deidre McCalla are on these tapes, as well as lesser-known but still important musicians Judy Fjell and Faith Nolan. Artists from the mainstream are featured, too. At Janis Ian’s 1995 performance at the National festival, she admitted to being nervous because it was her first time at a women’s festival and she didn’t do sing alongs. Tracy Chapman announced at her 1986 National performance that she didn’t have a recording; she invited women to call and ask her to come play in their hometown. Two years later, she had her first hit. (I’ll bet she changed her phone number.) The tapes also include writers Rita Mae Brown, Katherine Forest, Ann Bannon, Adrienne Rich, June Jordan, and Dorothy Allison. Comics? They taped Karen Williams, Kate Clinton, Marga Gomez and many more. Dance companies, plays, workshops, emcees and much more are also represented. Although they filmed mostly women’s events, gay men weren’t forgotten. You can also see film historian Vito Russo, and music duo Romanovsky and Phillips. I visited Donna and Pat whenever I toured their way. I was always treated to good Memphis barbecue and I could pick out any tape to view from one of the two crowded bookcases in the living room. I felt like a kid at Christmas. It always brought me back to the excitement of those early years, trying to figure out Meg’s guitar style or singing along with Dianne Davidson. When the National festival moved further away, they quit recording. It was already a huge investment of time and money; the extra drive would’ve made it too tough. As the years went by, Donna was diagnosed with a serious illness. Pat took care of her and Pat’s elderly mother until they both passed away. The tapes went in the attic. Recently Pat started thinking about a permanent place for these valuable tapes. She did some research on her own but was disheartened at the results so she asked me to help. I talked with friends and made a few other inquiries. She gave me most of the tapes to store. I had the immense pleasure of watching many of them, knowing that some had not been viewed for 10 or 20 years. I delighted in seeing a tuxedo-clad Maxine Feldman making announcements in that booming voice I hadn’t heard in several years. There was Therese Edell in one of her last performances, confident festival organizer Mary Byrne welcoming the crowd, and Kay Gardner presenting the very moving “Ouroboros.” One of my favorite parts of the tapes are at the beginning, just before the emcee comes out. The camera would focus on the microphone and I could hear the happy chatter of women’s voices. I was in some of those audiences and I remember that excited anticipation. At one break between sets, the audience burst out in an impromptu version of a Holly Near song; she was on next and they couldn’t wait. Pat and I narrowed it down to a couple of archives. 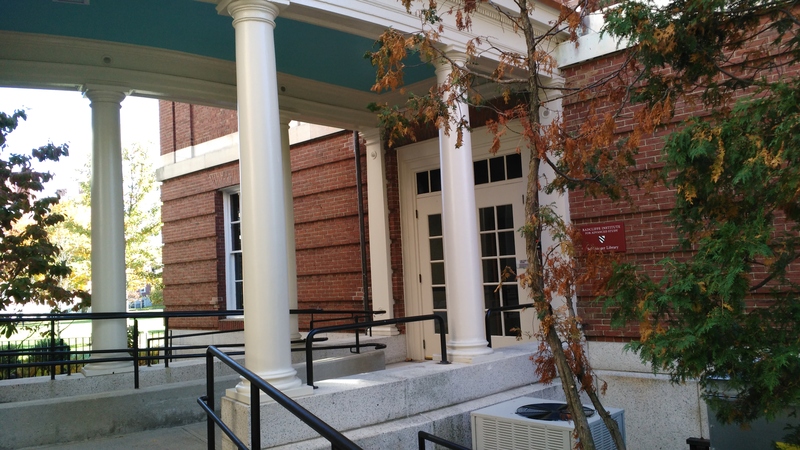 Pat chose the Schlesinger Library at Harvard. Their commitment to preserving the history of women was impressive. Joanne Donovan, the archivist who was my contact, assured us that the tapes would be available to researchers. 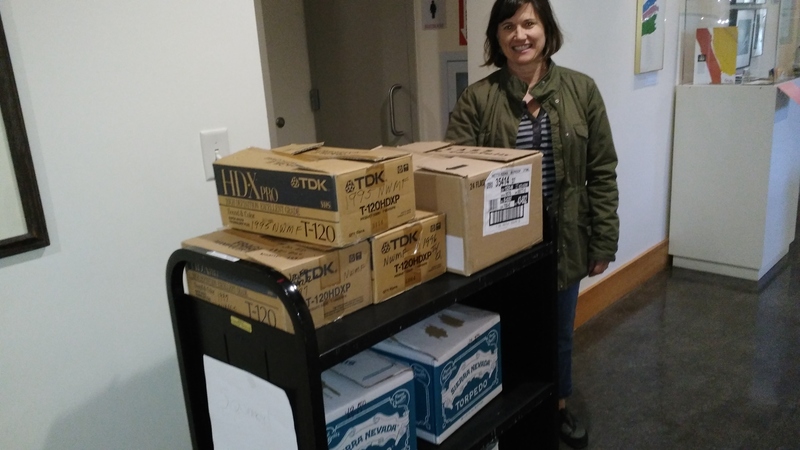 Archivist Joanne Donovan receiving the tapes. I delivered most of the tapes on a beautiful fall day on October 17, 2015. Pat still has a few boxes that she’ll deliver sometime within the next year or two. The tapes will be cataloged and put in a queue for digitization. This will preserve them for generations to come. If you’re an LGBT researcher, or simply a fan, you will soon be able to visit the library and view the digitized tapes. Some may even be put on line. It depends on the permission the artist gave at the time the recording was done. We aren’t sure exactly when the tapes will be available for viewing. If there’s a particular tape you wish to view, notify the library and they can put that tape at the head of the queue. 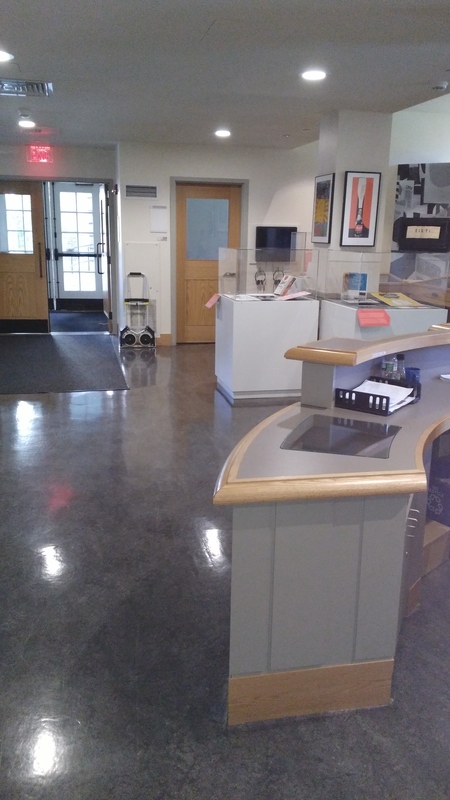 At any rate, you must notify the library ahead of time to insure that the tape you want is available. One of the boxes I delivered. If you would like a list of what’s on the tapes, contact me here and I can email you a PDF. (Be sure to include your email address in your inquiry.) The library may also have a list available soon. More about women’s music here. Photo of Therese Edell is by Toni Armstrong Jr.
Did you find this post helpful? Consider donating. It’ll help keep me in coffee and my cats in kibble. Merci. This entry was posted in LGBT music, Women's Music and tagged Dianne Davidson, Gulf Coast Women's Festival, Holly Near, Jamie Anderson, Janis Ian, Jo-Ed Video, Kay Gardner, lesbian authors, lesbian music, Meg Christian, National Women's Music Festival, Tracy Chapman, womens music. Bookmark the permalink. Thank you so much Jamie. as usual a great article/essay and insightful looks into our culture. 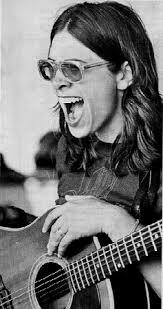 I really appreciate the pic of Terese…I hear her song “women’s faces” a lot of the time in my head these days. I wish someone would post that…it is so appropriate in todays world…my opinion. thanks again Jamie and the women who archived these tapes…I would like to know if the reading that Leslie Feinberg is included..lots of women and talks I would love to see. There was a time when I wasn’t sure about letting the world at large in on our culture…those days have passed and my selfishness has changed. Harvard eh? wow when I first saw this I thought of the Lesbian Herstory Archives in Brooklyn…guess Harvard has more space or better recognition…at any rate I am thankful for these women and the preservation of some truly life changing art. thanks for the post.